Order your copy today for $49.99 plus tax and shipping & handling. Copies are also available in the Belmont Campus Store. Those new to Belmont University’s story might assume that the school, with not only its historic architecture’s beauty but also acre upon acre of soaring new state-of-the-art structures, was simply dealt a better hand of fate from the beginning—powerful, well-connected founders, perhaps, or coffers overflowing thanks to generations of inherited wealth. 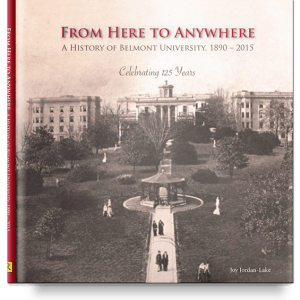 And given Belmont University’s present-day reputation for creativity, entrepreneurship and excellence in academics, the arts, athletics and service, those new to its story might assume its past consisted of 125 years of seamless transfers in leadership, vision and purpose. From the very start, Belmont was working against all the odds. Like so many American institutions of higher learning, Belmont’s story has been a patchwork-quilt heritage of ideas and philosophies. Even the demographics of its student body have ranged in different eras of the past from the most socially and economically elite to first-generation college young adults who would have to work several jobs to put themselves through school. Consistently, though, Belmont has retained the best of each era and forged its own way, regardless of what others insisted could not be done. The Belmont story is one of finding new paths, of not letting ideas of the safe and expected determine a school’s limits. Of becoming builders of bridges, not preservers of old barricades. It’s a story of an extraordinary faculty, staff, scholars and industry experts guided by a far higher calling than merely making a living. It’s a story of risk and innovation, of thinking outside the box—as well as the courtroom, the classroom, the corporation, the gym floor. It’s a story of faith that God has created each student—and Belmont itself— for a purpose. It is a story worth hearing.